Coccyx cutout extends from back of cushion all the way to the center oval cutout. 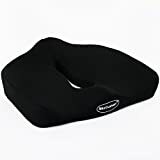 This provides complete comfort for sore areas and also helps improve airflow so user is cool and comfortable Wedge shaped cushion features tapered design – thicker in back and narrower in front. This allows complete support where you need it (tailbone, buttocks) and less support under thighs. Especially helpful when driving or sitting at a desk. This design also helps circulation under thighs. Ergonomic design helps promote proper posture by slightly tilting the pelvis forward. This maintains the spine’s proper lumbar curve for low back comfort and pelvic support. Constructed of one-piece molded support foam – designed to provide optimum support while remaining comfortable. Cushion is 17 inches wide x 16 inches deep x 5 inches ( at the highest point for tailbone). NEW ORTHOPEDIC CUSHION DESIGN – Developed by doctors provides relief for a variety of conditions including tailbone sensitivity, hemorrhoids, coccyx and back pain. ALL DAY COMFORT – Ergonomic design contours to comfortably provide all-day support while driving, at the office or home. PROVIDES BETTER RELIEF THAN OTHER DESIGNS – Multiple relief points using corner lobes in key areas provide multiple relief points and improve balance over other cushion designs. HIGH QUALITY CUSHION – Made from premium grade memory foam and fabric designed to LAST. 100% SATISFACTION GUARANTEE – We stand behind our product and will replace or refund your purchase if not satisfied.